If it hasn't already occurred to you, it is more than a little risky to design a beautiful Layered Curriculum unit this weekend full of choice and variety and walk into your classroom Monday, hand it to your students and say "Well here you go. You have 2 weeks to do whatever you want. Have fun." Aarrrgghhhhh! You will fail and so will your students. Unless you have a room of students fresh out of the neighborhood Montessori school, most students have no idea how to operate in a student-centered classroom. And most teachers don't know how to manage a student-centered classroom. So the best advice - go slow. Start with what you do right now and add one component. See how that goes, then add one more piece. A popular way to begin is to make your unit sheet look like a daily assignment sheet. With this "daily method" you will start the class period with some whole class instruction, then offer the students a choice of two or three assignments which follow your instruction. They must complete one by the end of the class period. Most students can handle that as it looks familiar. They listened to some instruction and now they choose one of two activities to complete within the class time. You can design your whole first unit using this daily method. Students only have to choose between 2 or 3 assignments on any given day and deadlines are strict (something is due today). Homework may or may not be added depending on your subject. This same advice holds true with assessment. Many teachers start out thinking they have to visit with every student every day about every assignment! That's a great goal, but give yourself time to work up to it. Oral assessment gets more efficient with practice - yours and the students. Start by just discussing one assignment in the unit. Or let the students put a portfolio together and have them select one or two to discuss with you. Try grading a day behind the students - you grade today's assignments tomorrow while they are working on the current day's work. Have students turn in work every day, but you will visit with them tomorrow. 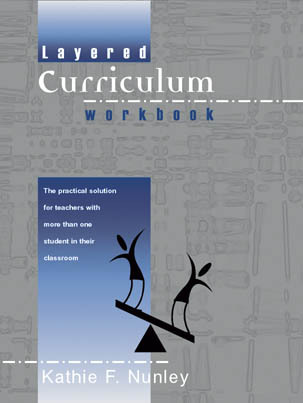 Finally, start with very short Layered Curriculum units. Two or three days works well, or maybe one week. Keep in mind that your first unit probably won't run smoothly. There will be much you want to change. If you keep it short, you only have to weather a short storm. Teachers who persist through three units seems to have mastered Layered Curriculum. Don't get discouraged. Start with lots of structure, a format that looks familiar to both you and your students and be prepared to make some mistakes in the beginning. But your efforts are greatly rewarded as students learn to take responsibility and control of their own learning and you feel valued as their facilitator.